One of my bike routes takes me past Albany’s Talking Water Gardens, and usually nothing much happens. Today, about mid-day, I could not help but notice, in the distance on the other side of the ponds, smoke and the flashing lights of emergency vehicles. I wheeled the bike around to take a closer look, and the video shows what I saw. In the Millersburg yard of the Portland & Western Railroad, a boxcar full of cardboard bound for recycling had caught fire. The alarm had brought engines and firefighters from the Albany and Jefferson departments, including at least one unit from the Talbot station. I counted eight pieces of apparatus, but there may have been others I could not see. UPDATE: Later, 3:49 p.m., Division Chief Mike Trabue of the Albany Fire Department issued a news release with additional information: A contract worker had tried to get into the car, owned by Georgia Pacific, and “attempted to loosen the box car’s locking system with a heat source.” (Upon further inquiry, Trabue said it was some kind of “flame-producing torch,” like a cutting torch.) 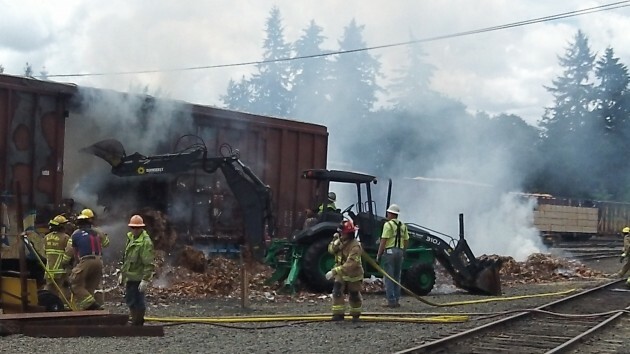 When the worker noticed the fire, he called 911. The loss was estimated to be worth $70,000 for the cardboard and $50,000 for the rail car. No one was hurt. Twenty-two firefighters responded, including some from the Tangent department. Off-duty personnel from Albany, Lebanon and Corvallis responded to Albany to handle subsequent emergency calls while this one was still active. The alarm came in just after 11. The first Albany crew to get there asked for water tenders because the yard is far from hydrants. The burning car was the middle one of three, and railroad employees detached and moved away the outer ones.